Hello everyone！Our new Chinese classes will begin at September 14，everybody who is interested in learning Chinese language and culture is warmly welcomed to join us and we will continue to try our best to provide classes with best quality. (1) Chinese Language Basic Level 1:for beginners,without any Chinese language background. (3) Chinese Language Intermediate Level 1（Level 4）:for the students who passed the basic level 3 class. Notice：Chinese classes are the credit course of UG. 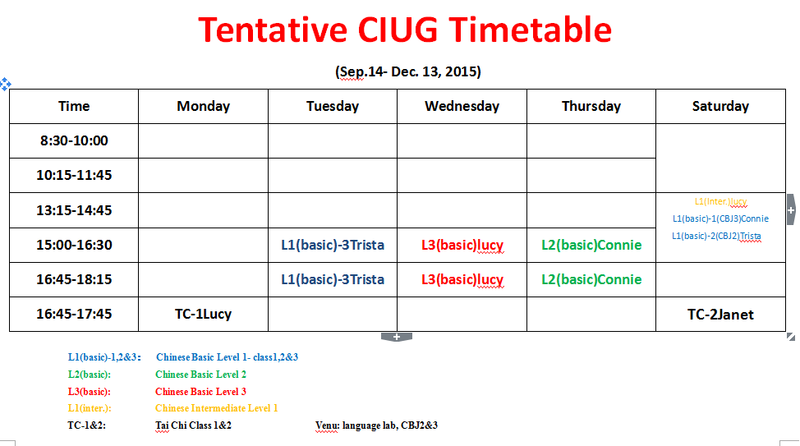 Classes will be held from September 14 to December 13-four classes per week. UG Students and staffs for free. Please bring a valid ID when registering.